So, Drum Roll! Top Of The Heap! The New Yorker cover! Is this the Holy Grail job? Maybe not any more – maybe it isn’t seen as cutting edge enough (also it’s blurrily on the border of art versus illustration) but… it is the most visible cartoon job in the world. and I like a drawer with a worldview, and John Cuneo has one, like all of the greats. BRIEF I will occasionally send Francoise Mouly, NY’s art director, rough sketches for potential cover ideas, the vast majority of which are summarily dismissed. MATERIALS Ink and watercolor on paper. RESEARCH I combed through a couple of dog magazines for breeds that might lend themselves to a bit of anthropomorphising, and worked backwards, to the dog owners, from there. Also found a little downtown (NY) street reference. PROCESS Was asked to work up a colour comp first, and then a final. And then another version, one with more of a “summer” wardrobe and feel to it. Each effort getting progressively tighter of course, and incrementally less funny. 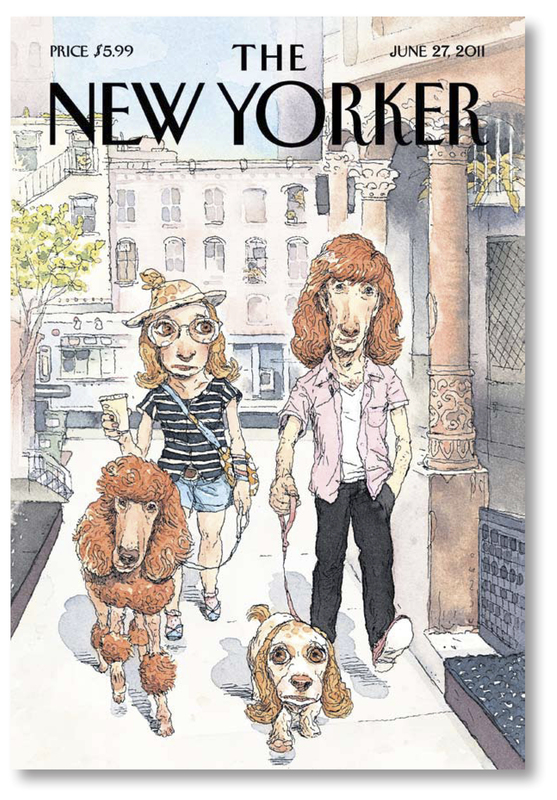 DISTRACTIONS After the art gets accepted and publication is pending, one selfishly hopes for an uneventful news week—so that a cover-worthy current event doesn’t rear up and usurp your little dog gag. NUMBERS 5. The number of Irish Water Spaniel owners who sent me pictures of their pets. 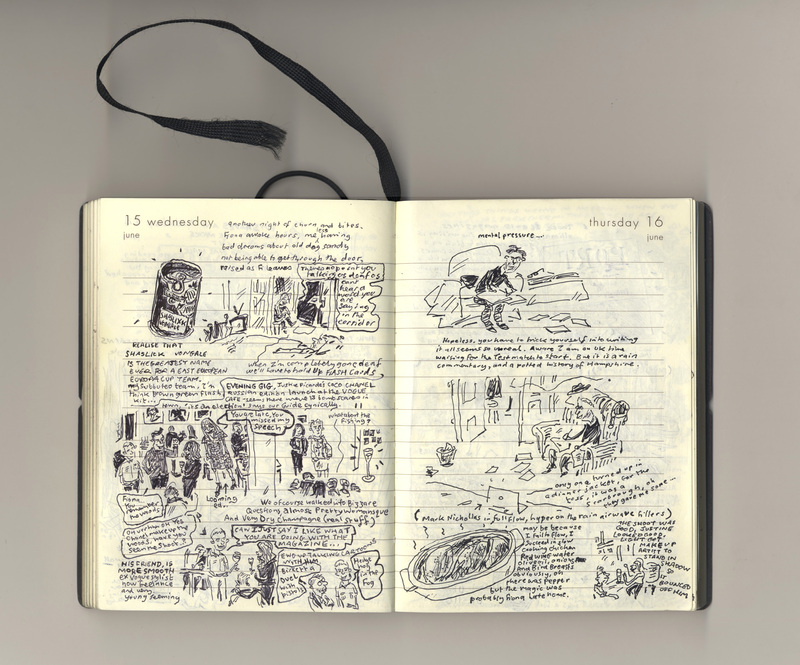 You might call Steve Way’s visual journal The Loneliness Of The Long Distance Cartoonist. Follow our hero, Steve, as he maps out his daily rounds – of cartooning/ living/organising builders/cooking food/attending glittering fashion shows – and commutes between London and Moscow in an attempt to spend time with his partner Fiona, Art Director of Vogue Russia. In the tradition of Art Spiegelman, an everyday relationship is explored in extraordinary detail and Steve gets to use up Moscow’s supply of Indian ink. BRIEF Self-imposed, but girlfriend said it first – “You are a lot funnier in real life than you are in your cartoons”. Also real life is a lot more interesting, with her working in Moscow, than another UK joke about the recession. The fact that the gag is drawn on a heavy Stalinesque table in an ex-Soviet 1958 apartment (on my visits) is the wry bit. 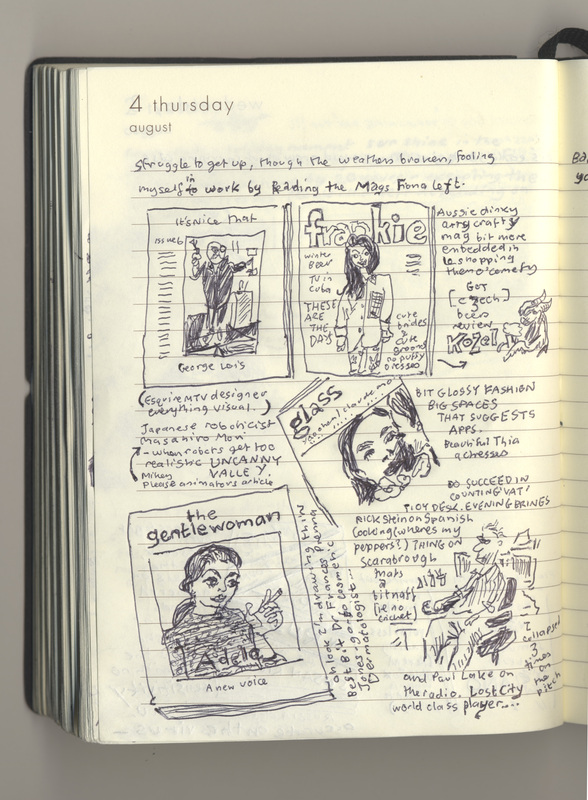 The diary structure, sticking to what happened on that day only, hopefully keeps the whiny graphic novel tone at bay. MATERIALS Dip pens bleed too much, pencil’s too faint and doesn’t look permanent, so initially black felt tips (Edding 55, Mitsubishi Uniballs, anything 0.5.) However, the line was a bit continuous and not good at showing the foul winter Moscow throws at you. So now it’s fine black biros you can hatch with, that give a slightly broken line when you draw fast, plus clog romantically when they are about to run out. It looks like ‘real’ drawing. RESEARCH Remembering. Busy days are the worst – cue hunting for scraps of paper I’ve written one- word tags of the day’s events on. All drawings are from memory, the exception being the covers of books/mags read. I try to get the type sort-of-right by having them in front of me. PROCESS Always behind, so there are bursts of catch up, often 3-week clumps. It takes about 3/4 hour per page. There are no roughs, I just start. Some days I draw badly and improve, others the reverse. In fact a really good passage of drawing slows you down, as the page opposite has to have the same care. My spelling is always a random process. The record for pages in a day is 15. A scary amount of drawing. NUMBERS One page, One day, one A5 Paperchase—pink, so I can find it—diary. Ruled lines on each cream page, all ignored. Sadly a lot less British Midland air miles to Moscow than you’d think, so still not able to draw the First Class lounge. You can’t cheat. The modern world of the image demands that he straddles all of these nomenclatures. 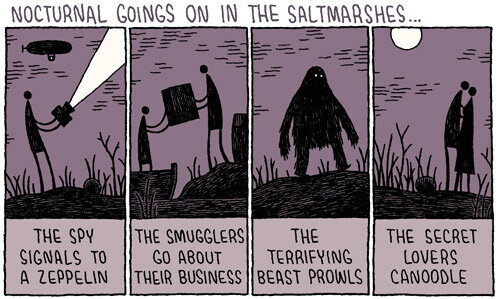 His recent Guardian cartoons are also, I would suggest, poetry. MATERIALS Uniball pen and correction fluid on paper, then Photoshop. PROCESS I begin all my projects doodling in my sketchbook. 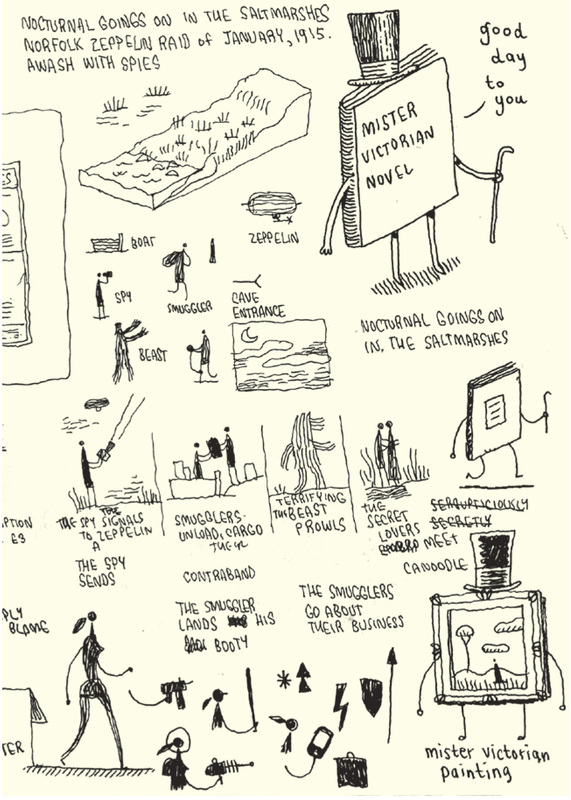 These are the doodles for Nocturnal Goings On In The Saltmarshes (Mr Victorian Novel was for the following week’s cartoon). Once I have an idea, I will draw a pencil-version, which I scan into Photoshop and fiddle with. When I’m happy, I print it out and make the final ink drawing by tracing on a lightbox. This gets scanned back in, tidied up and coloured. I’m very lucky that Roger Browning, the art director on this, trusts me enough that I don’t have to do a rough. I just make a cartoon and they print it, which I find very liberating. Though they did once ask me remove the word “Wanker”. DISTRACTIONS Turnaround is quite tight: I get the letter on Tuesday afternoon and hand in the final art on Wednesday morning, so I’m quite focused. NUMBERS This was my 254th weekly cartoon for The Guardian Review. To see the completed Nocturnals cartoon go to http://www.varoomlab.com.